Bicycle Touring, Bike Camping & Anything Bicycle! Cannondale Touring Bikes are Back… Almost! The Flight Path Trail circling Victoria International Airport (YYJ) has become a great success with locals and visitors who are utilising this marvellous resource. At approximately 9.3 km in length it provides many with a safe alternative to walking, running, cycling on busy roadways. 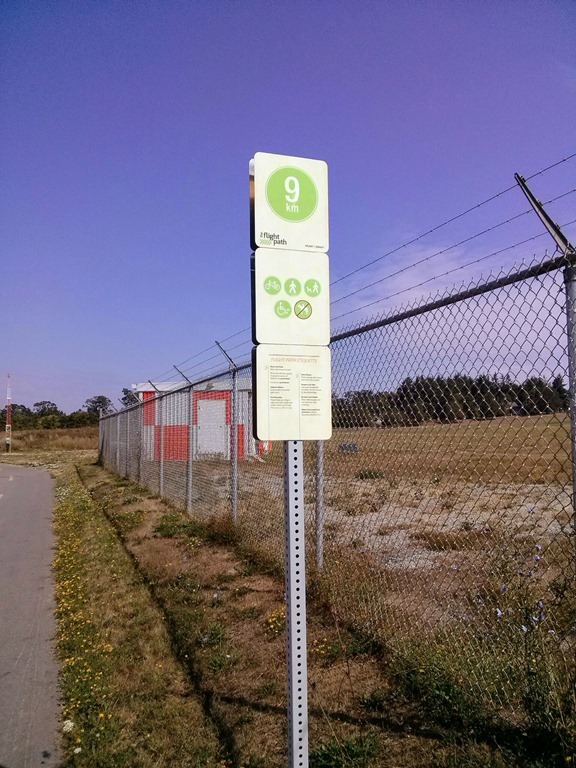 The Trail also provides a safe means for air travellers/visitors with bicycles to access the Lochside Trail system via the Beacon Avenue crossing from the Flight Path Trail. Now users can judge the distance travelled along the trail by viewing the newly installed signposts at every kilometre. The signage has been installed as a joint effort between the Town of Sidney’s “Heartsmart” initiative and the Victoria Airport Authority. A very nice addition to the trail, the “Heartsmart” initiative promotes good heart health through regular exercise such as distance walking. Mile Zero of “Heartsmart” on the Flight Path Trail is adjacent to the crosswalk at West Saanich Road just north of the entrance to the Sea Plane Base (the Sea Plan Base historical information sign is at the same mile zero location). From there the markers are every kilometre following the trail clockwise. This entry was posted in Local Trails, Out and about and tagged Flight Path Trail, Heartsmart, Lochside Trail, Victoria Airport, YYJ on September 10, 2014 by AdamK's Cycling & Travel.